(Worcester) St. John’s (Shrewsbury) won the first ten minutes (17-16) and the last three minutes (11-2). 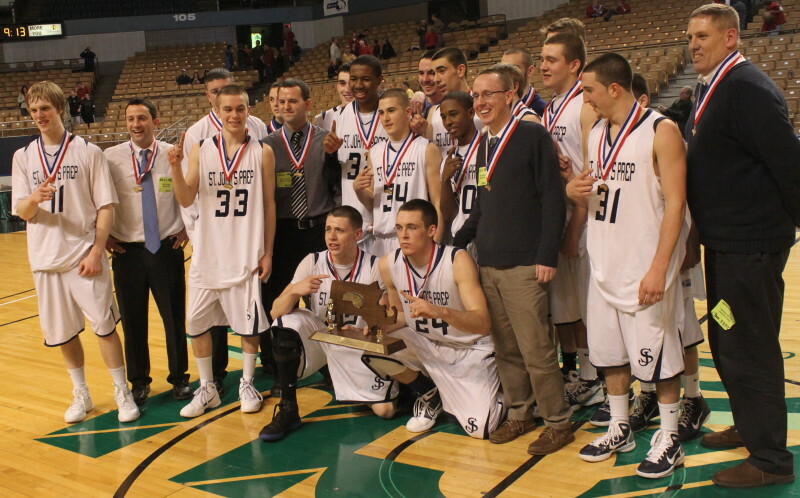 In between St. John’s Prep (Danvers) won the Division 1 boys title at the DCU Center on Saturday night. 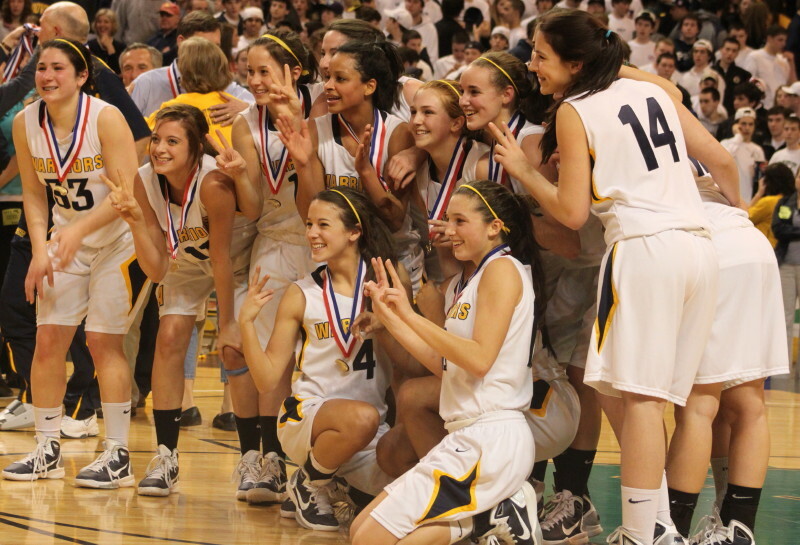 The “in between” numbers were 54-29, over nineteen minutes of play, in favor of the Eagles, and that spelled the difference in this one and gave them their first state title. Three players dominated the score sheet – Richard Rodgers (26 points), Steve Haladyna (29 points), and Pat Connaughton (25 points). During the decisive “in between” nineteen minutes, Steve collected twenty-seven of his twenty-nine points. Richard and Pat had fifteen points apiece during that segment. 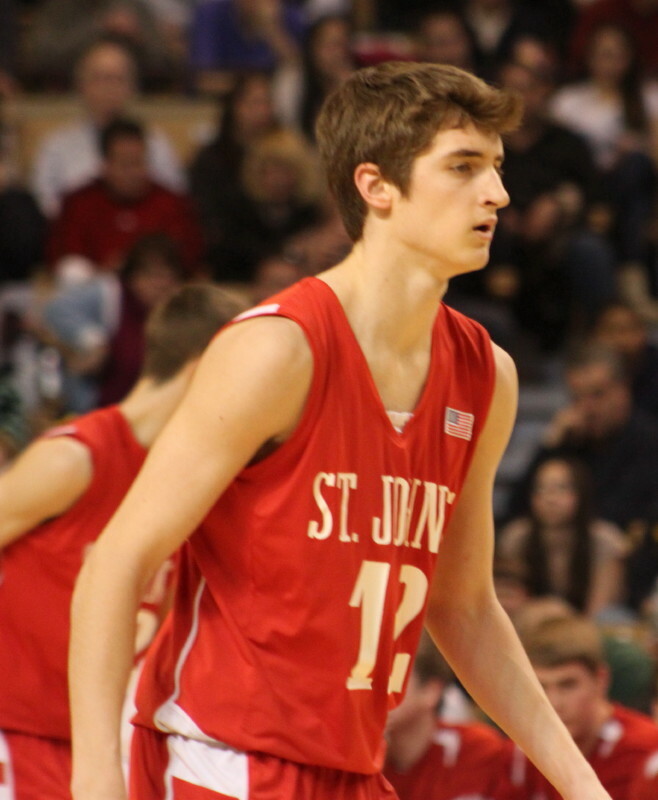 Steve (6-3 junior) scored from everywhere getting layups, jump shots, 3’s, and free throws. I didn’t see him dunk but it wouldn’t have been a surprise if he had because he had everything else going. 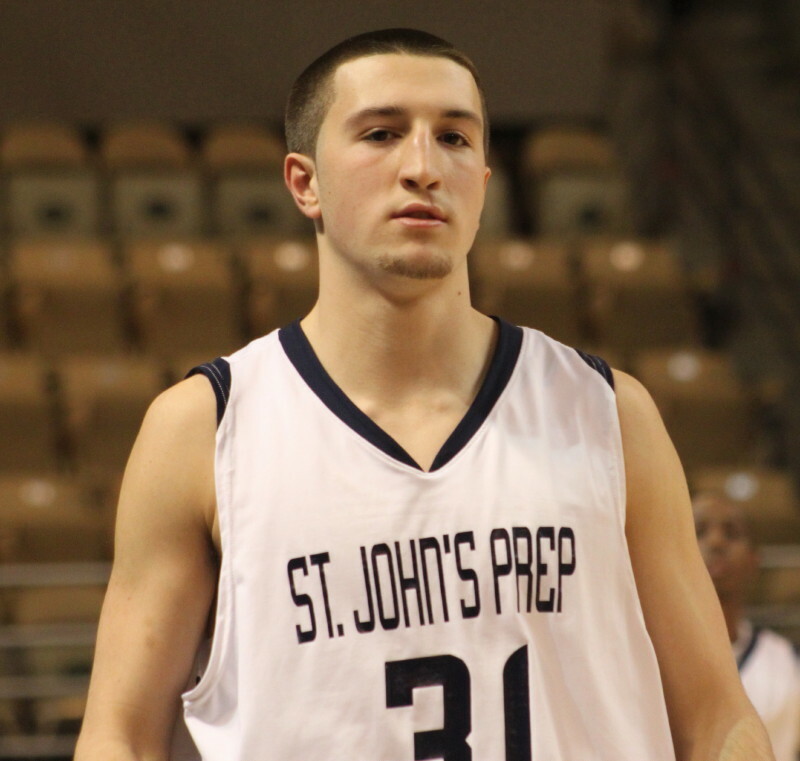 St. John’s Prep (25-1) shot an unreal 60% (21-for-35) during the game-changing segment while St. John’s of Shrewsbury (21-4) was limited to 32% (11-for-34). The Pioneers also committed ten turnovers while the Eagles had just four. The Eagles’ lead was 28-21 at halftime before they exploded for thirty points in the 3rd quarter alone. The Eagles started trapping early in the third period and it seemed to disrupt the Pioneers. The Eagles built their lead to 70-46 with three minutes left in the 4th quarter before the Pioneers went 11-2 the rest of the way. 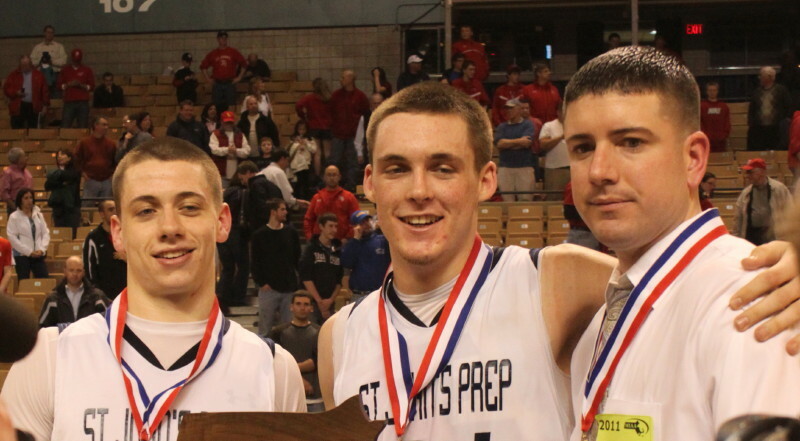 A big moment for The Prep was the removal of starters near the end, especially seniors Connor Macomber and Pat Connaughton. 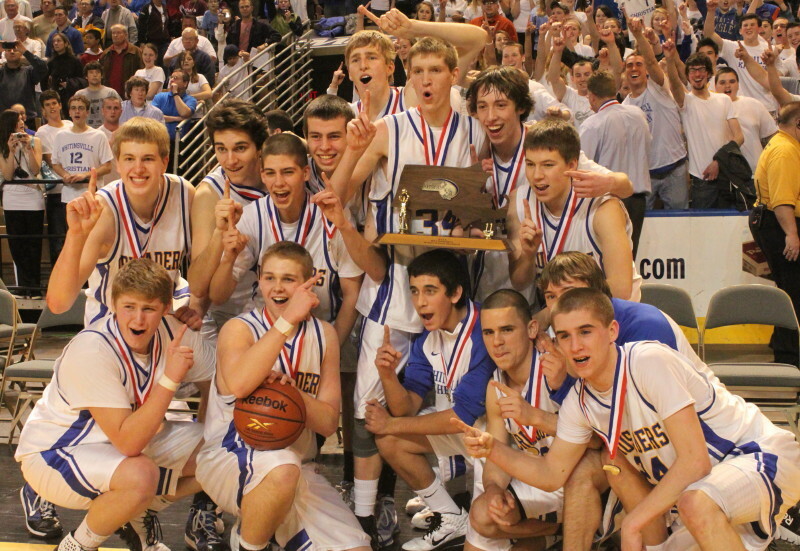 Plenty of talent is returning to Danvers so a trip back to the state finals is not out of the question. 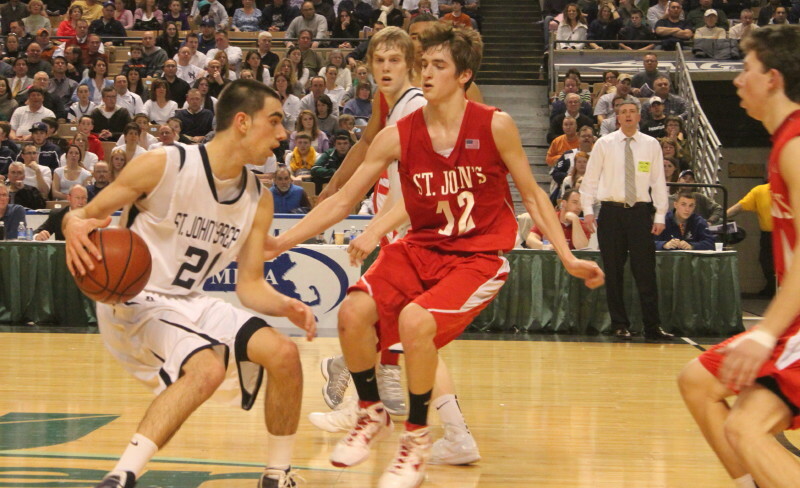 I saw a lot of St. John’s, “Pat-the-point-guard,” offensive set in this one. 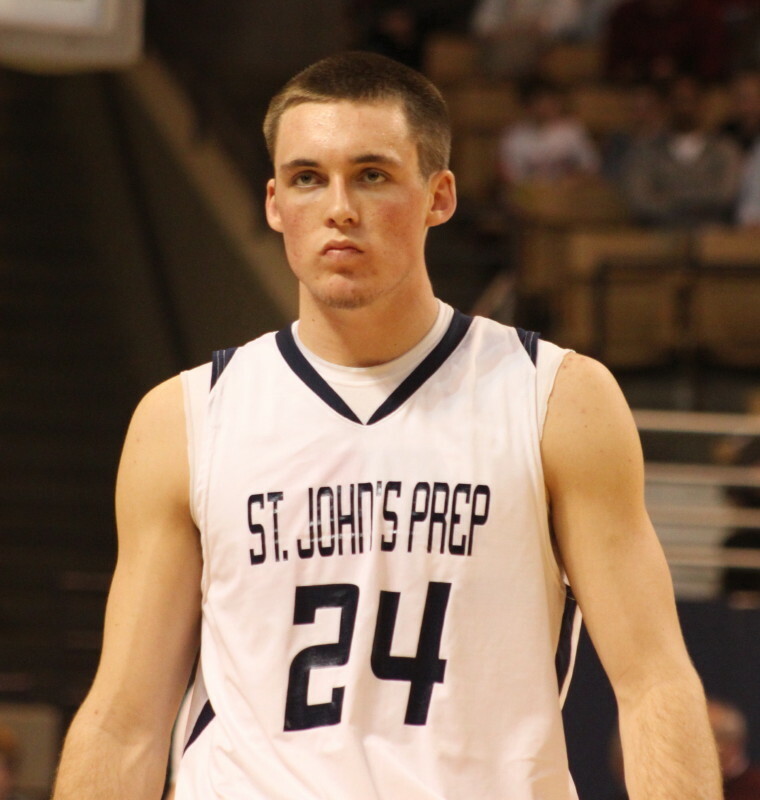 In it, Pat Connaughton brings up the ball and sees what he can create. Those not covering him often become less interested in the man they’re supposed to be covering when the Eagles do this. 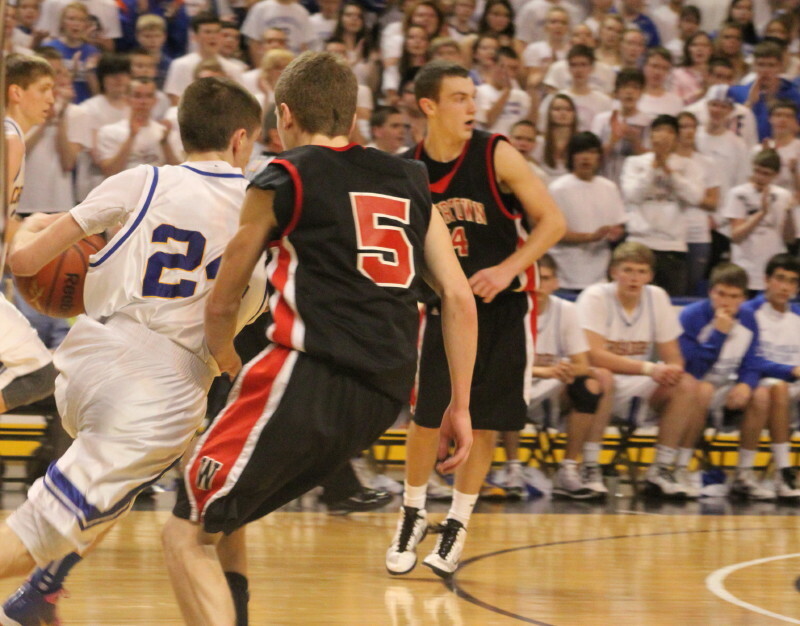 If the help defenders stay home it creates opportunities for Pat. If they try to help then the openings are there for his teammates. We’ve seen Pat shoot and we’ve seen him rebound. He turned out to be a pretty good ball-handler and passer in this game. You’d have to believe that at 6-4 his future at Notre Dame will be as a guard. He actually has the tools to play anywhere they let him! 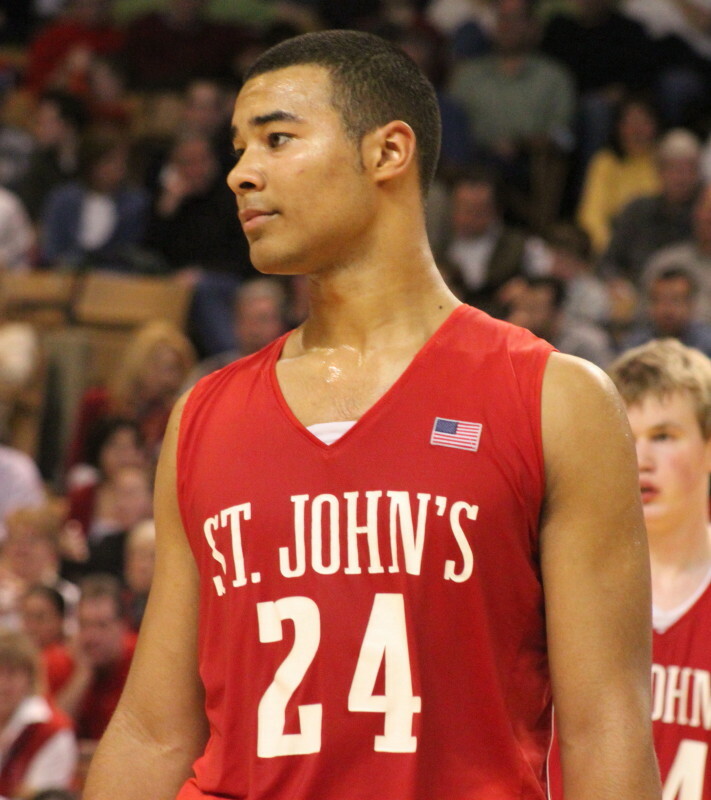 Speaking of athletes, I hadn’t seen the Pioneers’ Richard Rodgers before. He could well have played his last basketball game, although I’m certain there are college programs who would love to have him. He is committed to the California Bears where he will be a wideout or a tight end on their football team. At 6-5, 230, I guess he can play anywhere he wants! One of the more interesting sideshows was when Richard and Pat were matched up for a while. 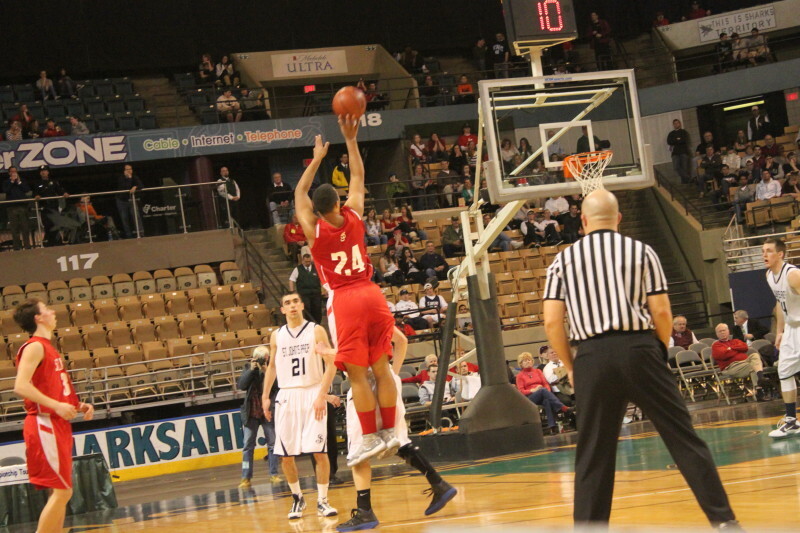 Pat managed to block one of Richard’s shots in the second quarter. I recall Pat doing the same thing to 6-7 Jimmy Zenevitch (Central Catholic) late in a game at St. John’s. The Eagles got away with a quiet game from Mike Carbone (3 points) because of the major step-up by Steve Haladyna. Senior Matt Harrington (17) and junior Matt Palecki (10) also reached double figures for the Pioneers. 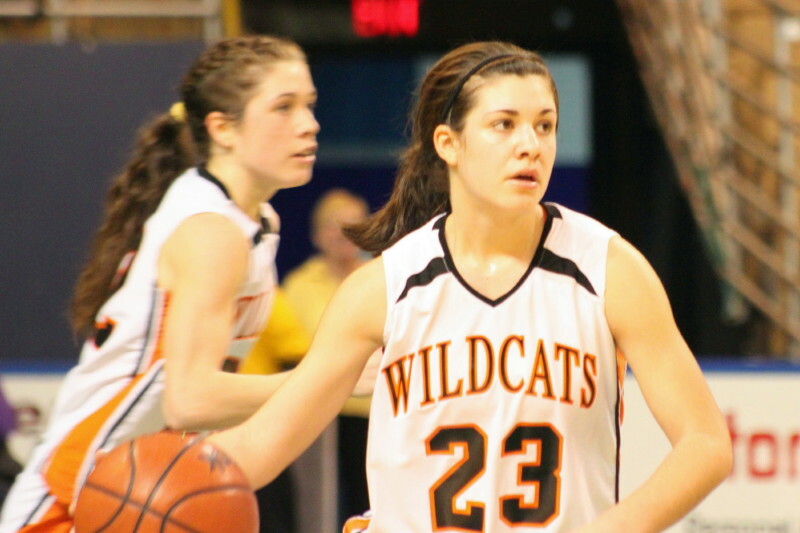 Taylor Bajema (14 points) hit three free throws in the last fourteen seconds to clinch the victory. 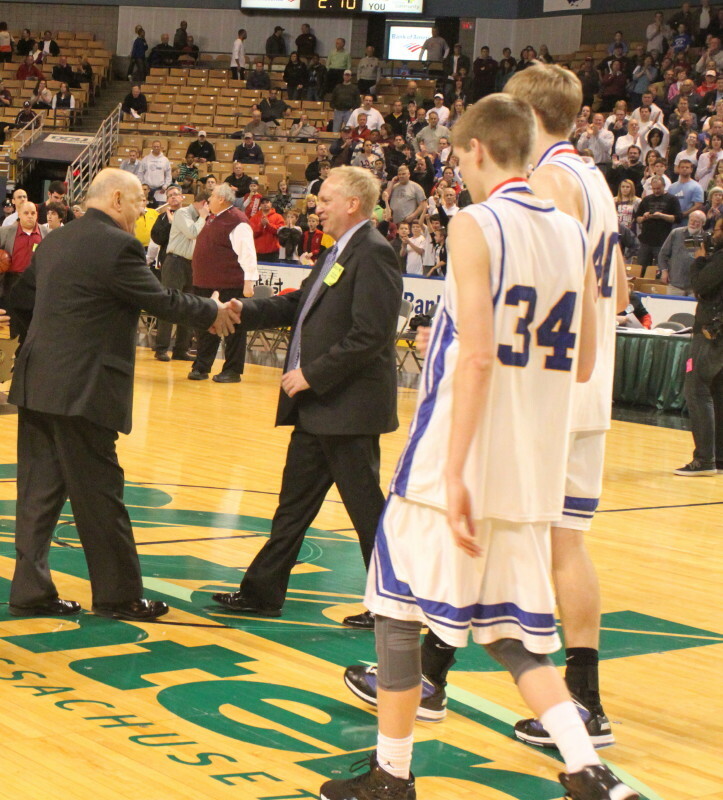 (Worcester) Watertown had Whitinsville Christian right where they wanted them – tied at 30-30 with five minutes left. The deliberate Raiders had run eight straight points, including a couple of huge 3’s by Cory Donahue (15 points), to tie the taller Crusaders. 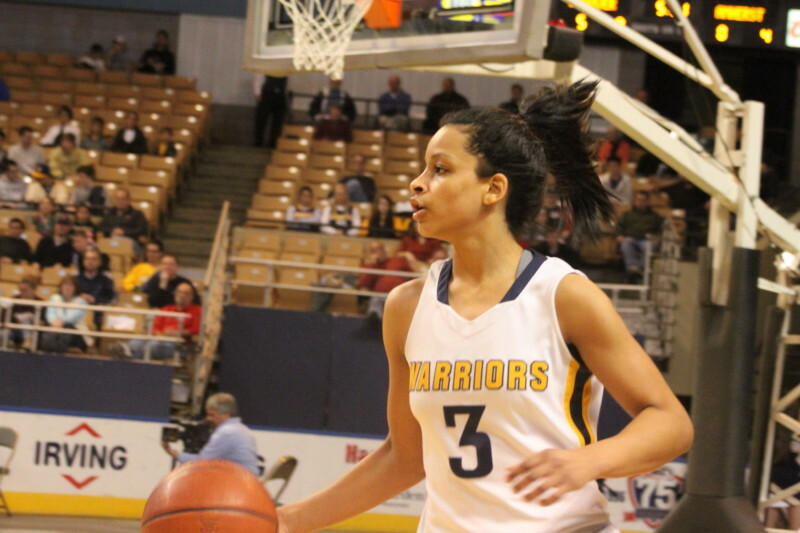 Whitinsville (23-2), however, accumulated twelve points in those decisive last five minutes, and came away Massachusetts Division 3 champs, 42-36, on Saturday afternoon at the DCU Center. 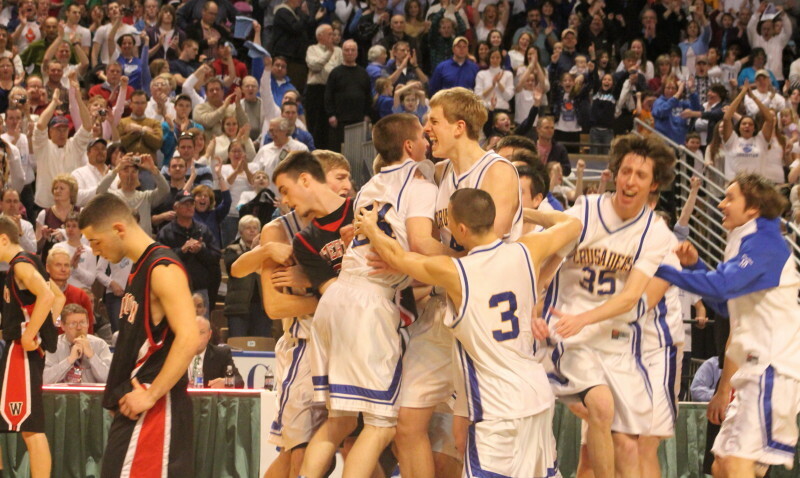 The Raiders (19-6) could only score six points in a frustrating ending for the ‘07 and ‘09 state champs. In their final twelve possessions (covering the last five minutes) Watertown had three turnovers and five missed 3-pointers. Marco Coppola (15 points) tallied all six of the Raiders points but in their last four possessions his stat line read: turnover, made layup, missed three, and turnover. 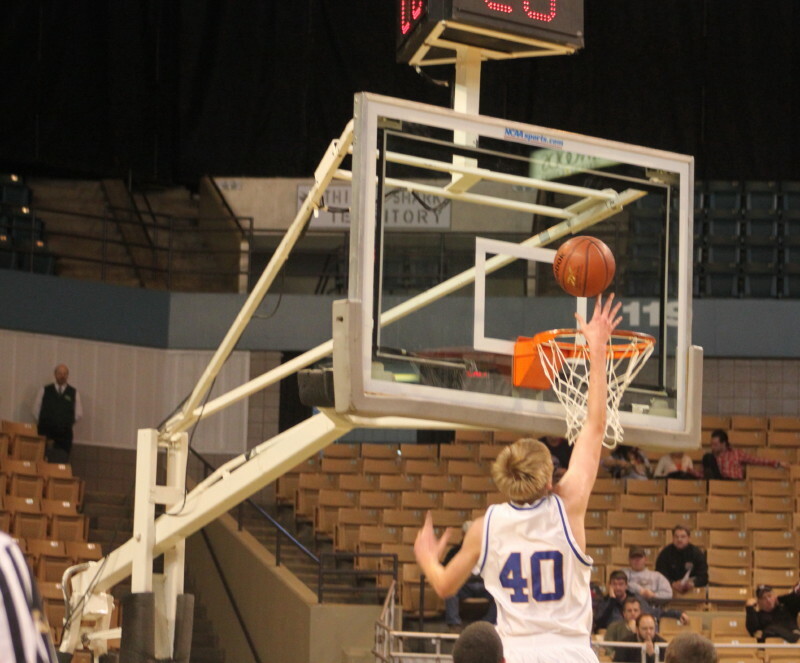 After the 30-30 tie, Colin Richey (12 points) hit a tough floater from the left to give Whitinsville the lead (32-30). Hans Miersma (12 points) followed with a free throw and Marco added two before Colin set up Hans Miersma (12 points) for a layup making the score, 35-32, with 2:15 left. That three-point cushion wasn’t much but on this afternoon the Raiders (6-for-35 from long range) couldn’t hit a big one to get closer. Their next two 3-point attempts missed and they were forced to foul. 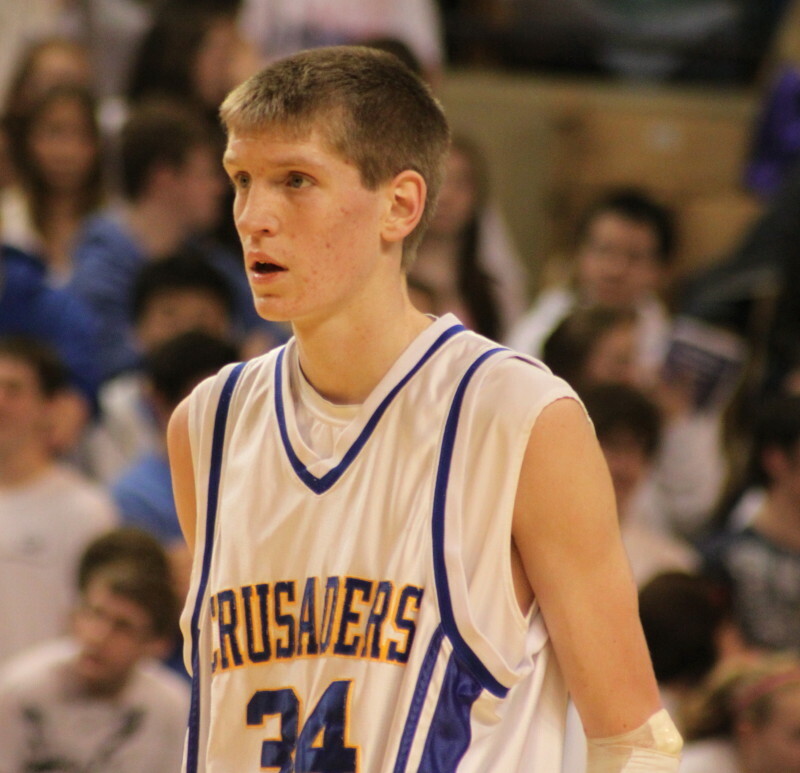 Peter Koopman made one free throw and Hans made two putting the Crusader up, 38-32, with 1:27 to go. Watertown was still just a turnover and a three away but WCS wisely got the ball to Taylor Bajema (14 points) and when he was fouled he made both shots (41-36 – :14). Marco tried an NBA three and missed and Hans did the same with two free throws with nine seconds left. 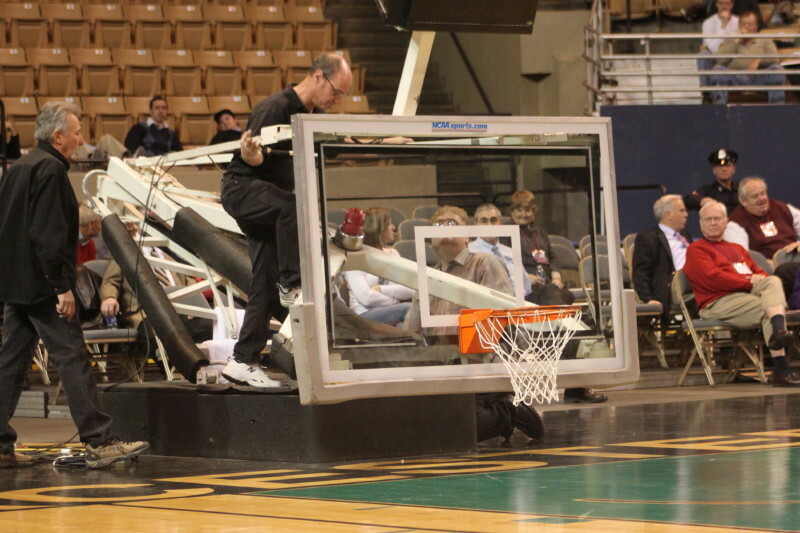 Marco then tried to go end-to-end and lost the ball out-of-bounds under the basket. 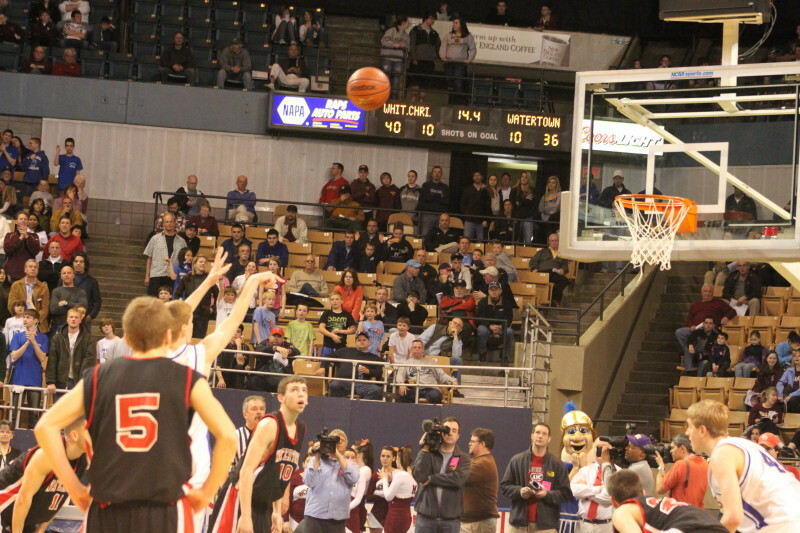 Taylor was again fouled and his last-second free throw ended the scoring at 42-36. Hans Miersma (12 points) gets off one of his few inside attempts. WCS had plenty of size and would have loved to have been able to get 6-9 Hans Miersma more touches. Raider ball pressure made that very difficult. 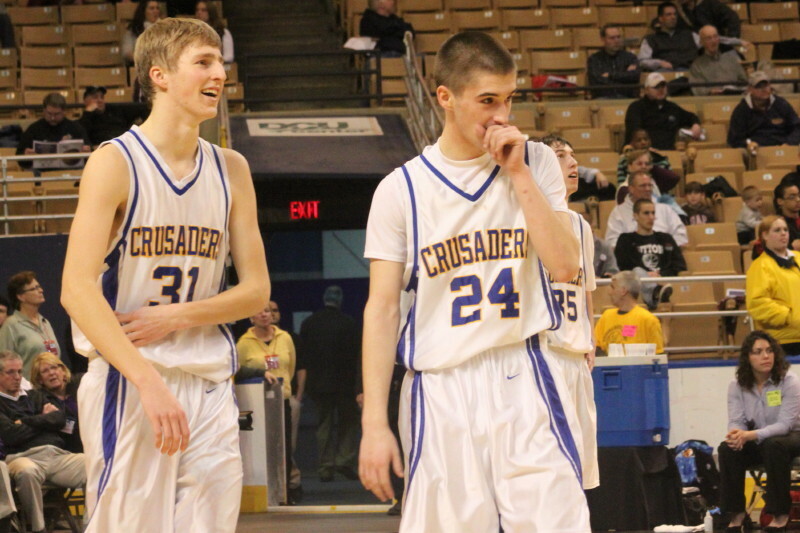 The Crusaders had twenty-two turnovers, many coming from trying to pass into Raider overplays. The Raiders were content to run the clock and settle for outside shots. Those tactics had kept opponents playing more defense than offense in the tournament and had limited every tourney opponent to 40 points or less. 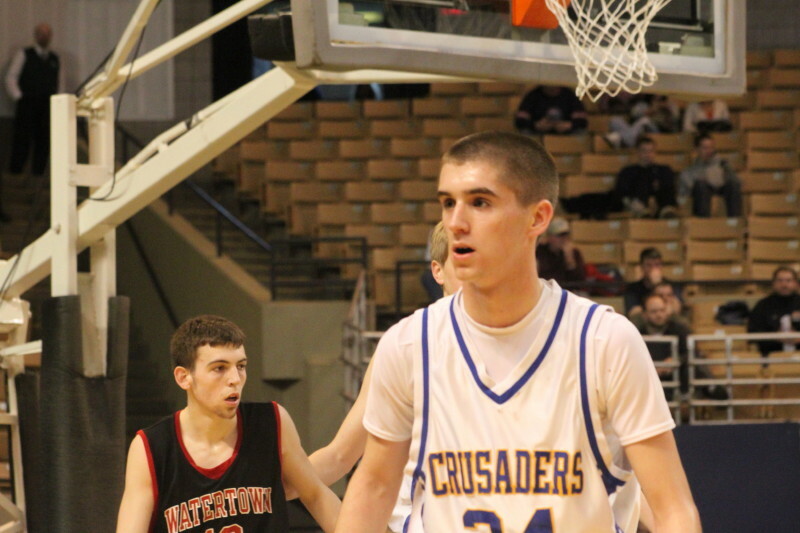 The Crusaders played an unaccustomed (for them) zone and probably wondered why, early on, as Watertown hit three of their first six long-range attempts. WCS stuck with it though and the Raiders hit on only three of their last twenty-nine tries. 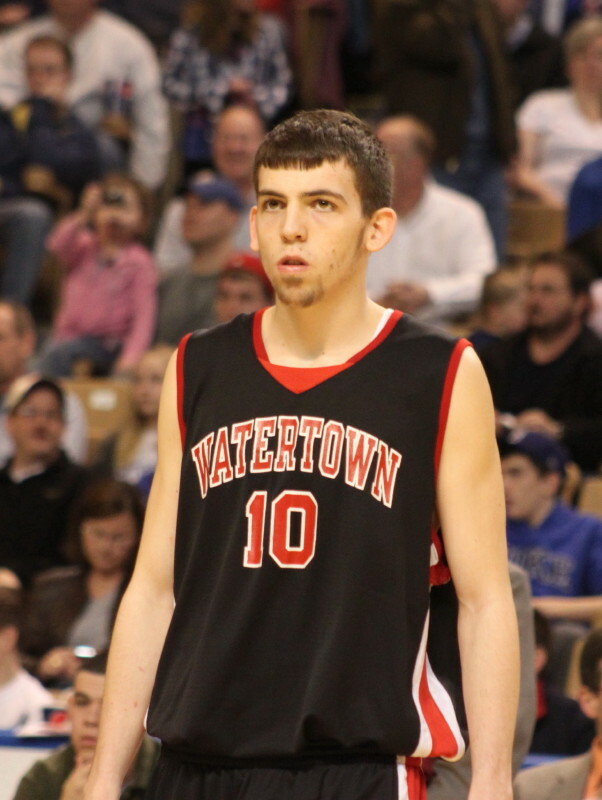 Cory Donahue made five of the six Watertown three’s. 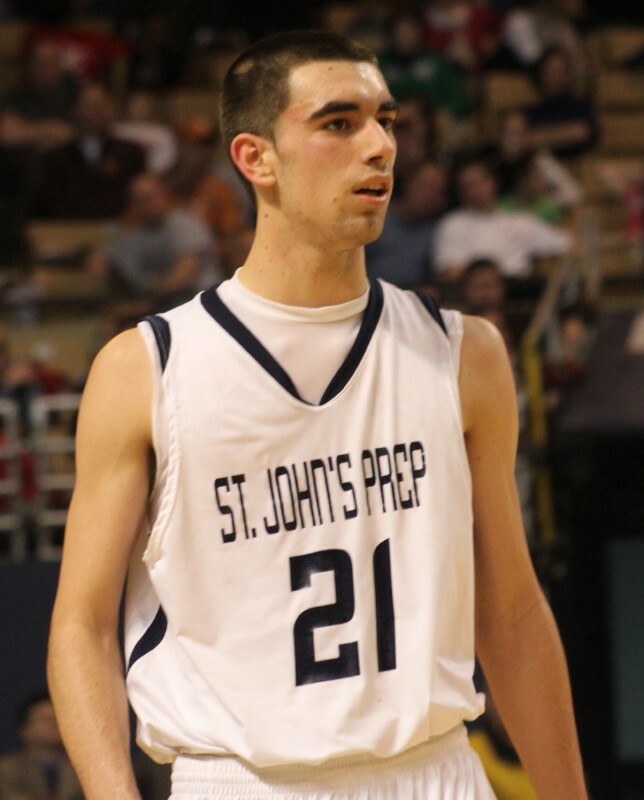 Marco Coppola led the state in scoring (26 ppg). I recall hearing someone in the pressroom say that he was leaning toward WPI for next season. He’ll score a lot of points wherever he goes. Hans Miersma had a dunk after a travel in the first half and did something to the clock above the basket in the process. I saw the possibilities for one of my life-goals take shape as the basket got lower and lower! Colin Richey (12 points) faced game-long tight defense from Tyler Romanelli (#5). Sophomore Colin Richey ended up facing the relentless full-court pressure of Tyler Romanelli as WSC’s primary ball-handler. Tyler had plenty to do with the Colin’s inability to find Hans in close to the basket very often. 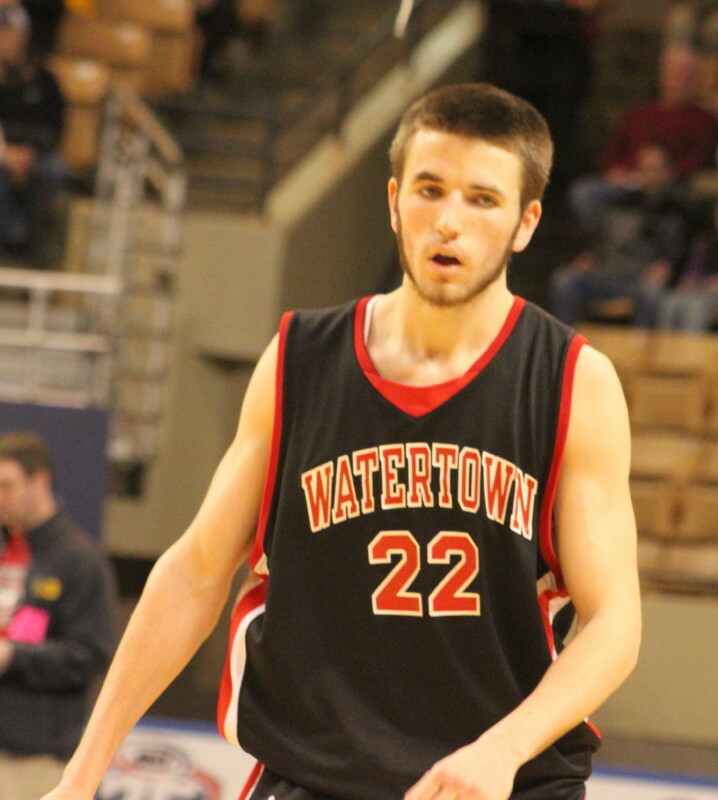 Watertown jumped in front 9-2 after 4 ½ minutes on Cory Donahue’s three 3’s. WCS rallied back into the start of the second quarter on an old-fashioned three by Hans, a Colin Richey jumper, and two Tyler VandenAkker free throws to tie the score. Watertown was held scoreless over the last 4:45 of the 2nd quarter while WCS got seven points (Taylor’s layup and jumper, Hans layup, one Colin free throw) to lead, 21-16, at the half. 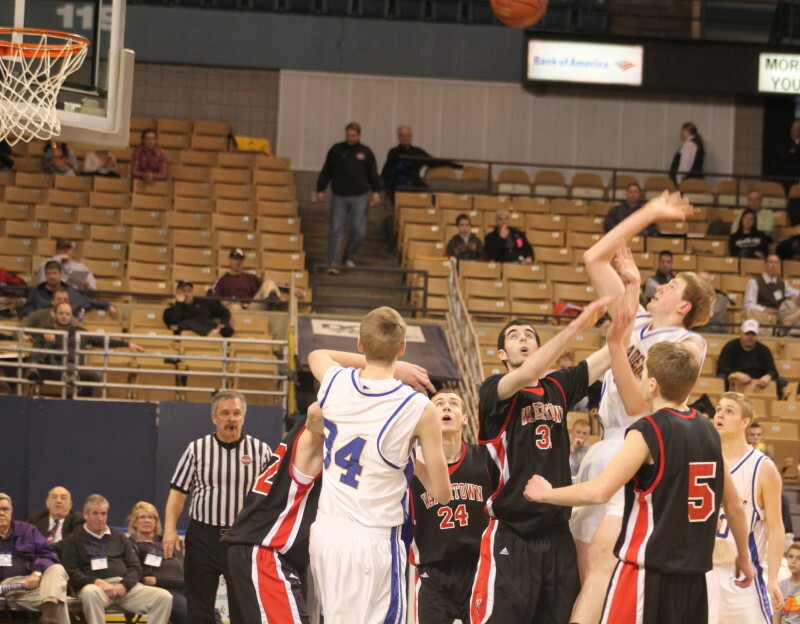 Watertown came all the way back to tie the game (30-30) in the final quarter. Thereafter (over the last five minutes) WCS went on the 12-6 run that won the game. 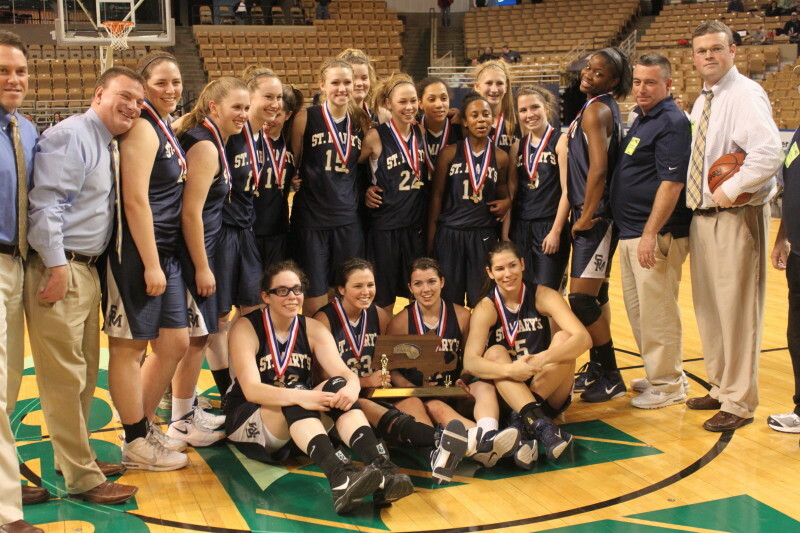 (Worcester) St. Mary’s of Lynn captured the Division 3 girls crown on Saturday morning over Lee, 64-54, at the DCU Center. Anyone who watched this game were impressed with the Spartans (24-4) as they shot and defended their way to a huge lead (60-38) after 27+ minutes. Good thing because over the last 4+ minutes of the game Lee (24-2) rattled off eighteen straight points to close to 60-54 with twenty-seven seconds left. 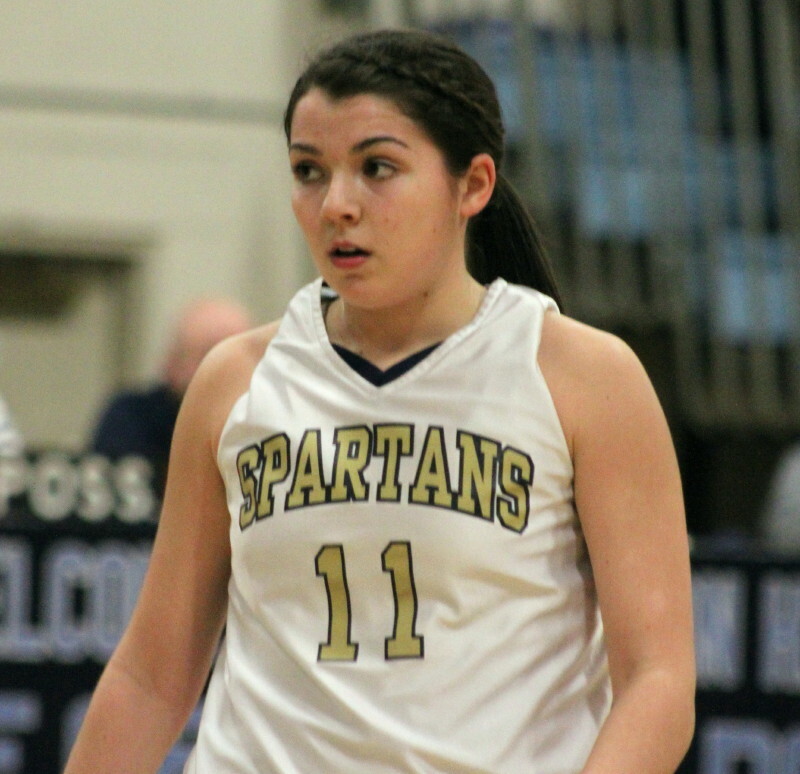 After a timeout, the Spartans finished with four Kirsten Ferrari (16 points) free throws and a blocked shot by Tori Faieta on Stephanie Young (14 points) to capture the crown. Lee had lost in February to the Spartans in Lynn by a 71-60 score. In that one, Lee fell behind 27-4 after one quarter before rallying to make a game of it. 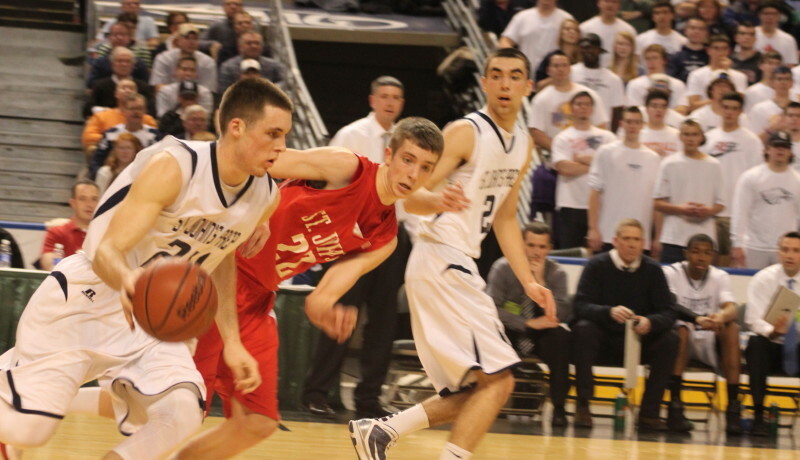 St. Mary’s had more than too much size for Lee. They also knew how to take advantage of it. 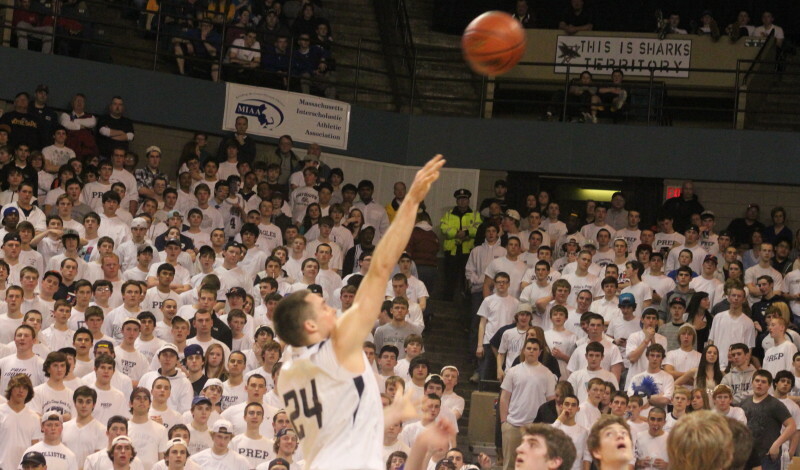 Nineteen of St. Mary’s twenty-six baskets came on layups. 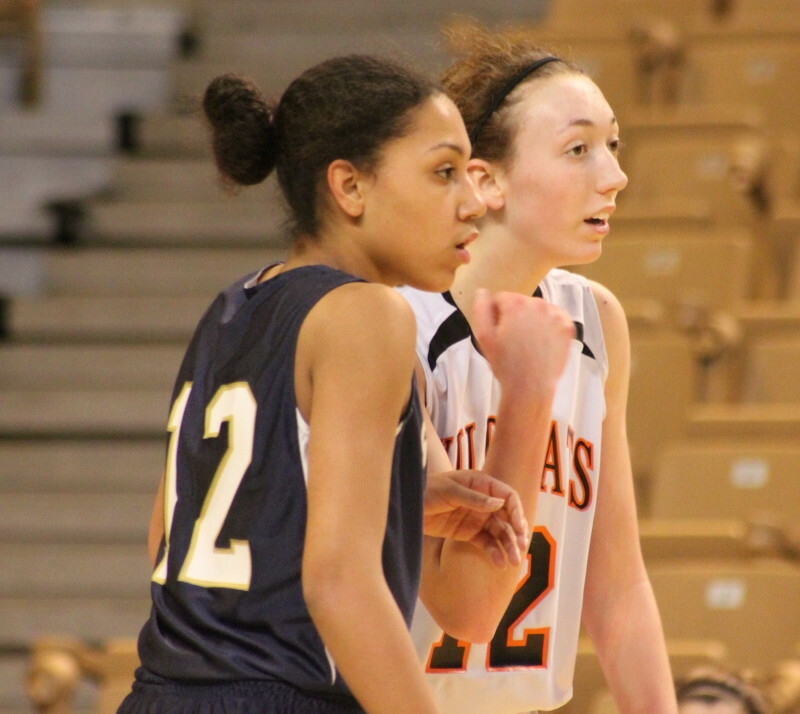 Many of them involved interaction between Cassi Amenta (16 points) and Tori Faieta (16 points). The Spartans had an alarming twenty-seven turnovers but it was Lee that was bitten by the miscue bug early. 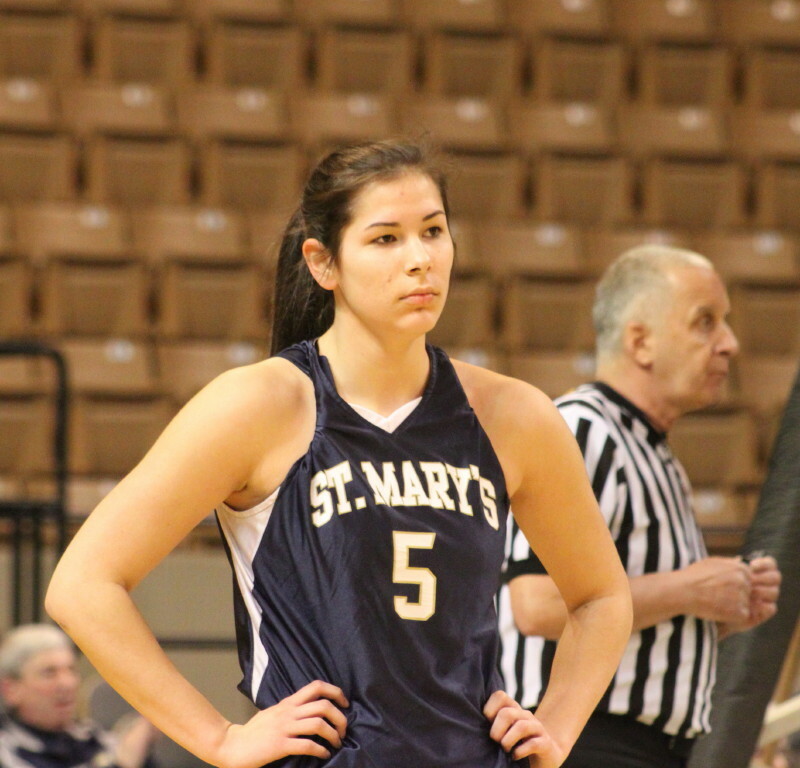 They committed four of their seven for the game in the first 4 ½ minutes and St. Mary’s jumped in front, 12-3. All six Spartan baskets were layups with two each by Cassi and Tori and one each by Brianna Rudolph (11 points) and Kirsten Ferrari. St. Mary’s ran seven straight (layups Cassi and Tori, jumper and free throw Brianna) to move ahead, 26-16, halfway into the second quarter. A three by Kirsten and another layup by Tori and the Spartans were in command, 33-20, at the half. St. Mary’s built the lead to 45-28, five minutes into the third period with five straight points with the familiar; Tori layup, Cassi layup, and Brianna free throw. Later, in the final quarter it was more of the same for the Spartans. This time the segment was 10-2 as Ann Marie Idusuyi, Sharell Sanders, Cassi, and Brianna hit 2’s and Kirsten hit her second three of the game. Eileen Dooley had the lone response for Lee. We’re talking commanding lead (60-38) with 4:15 remaining. 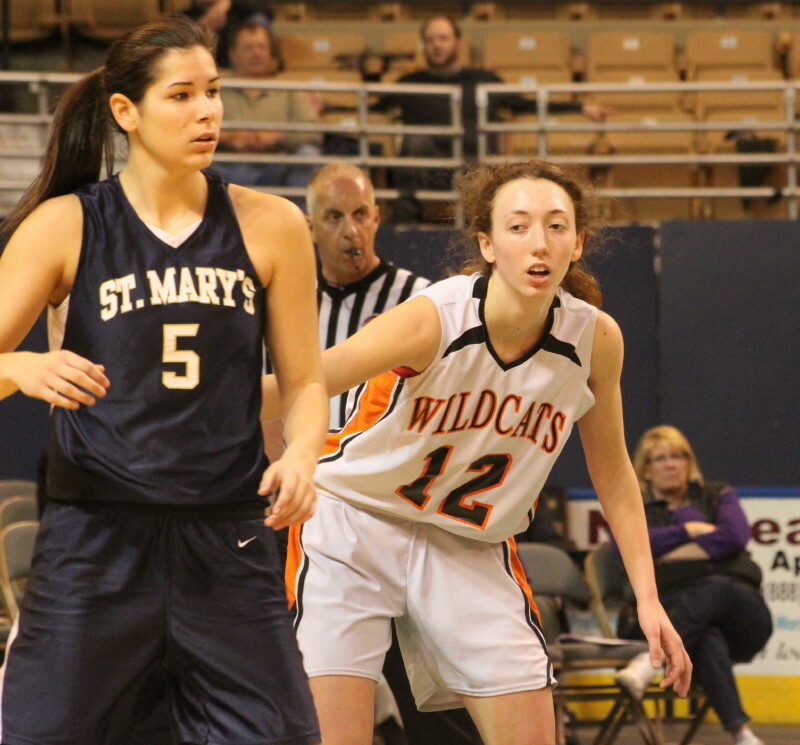 But ten empty possessions with seven turnovers later, Lee was close but Kirsten’s four free throws prevented St. Mary’s from being on the wrong side of what might well have been the biggest collapse in state final history. 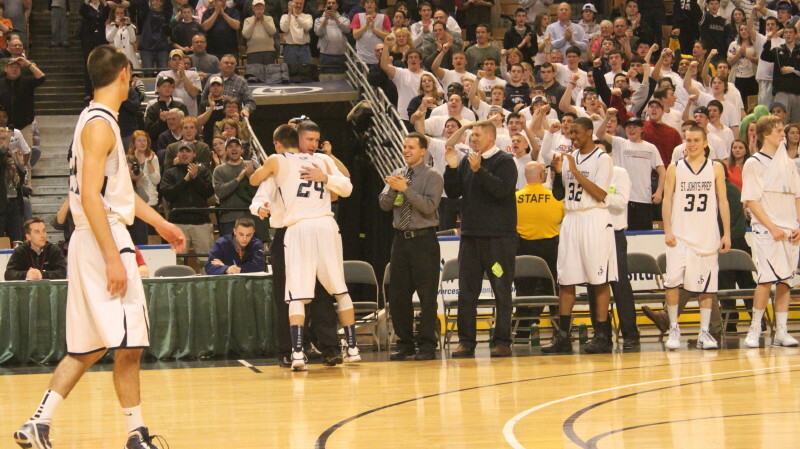 I saw Lee defeat Pentucket last year in the state final. I went in underestimating Lee because I didn’t know their history. I learned that their girls basketball program has won more state championships (seven) than any other school in the state in any sport, boys or girls. They aren’t used to losing and they play that way. That St. Mary’s could defeat them twice (in a season) is noteworthy. Stephanie Young (14 points) defends Cassi Amenta (#5). If Lee was looking for an excuse they could have referred to Alex Young being on the bench wearing one of those fearsome knee braces. She didn’t play, and apparently hasn’t played most of the season. 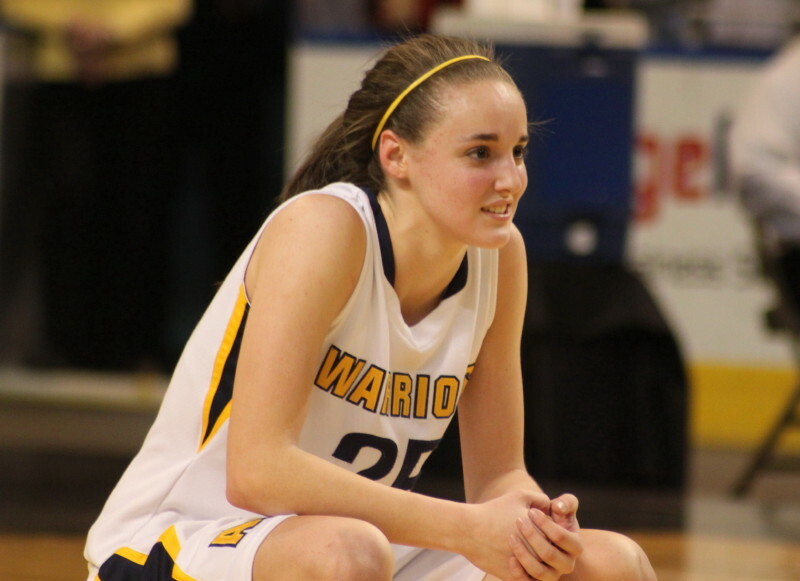 Last year she had twenty points in the championship win over Pentucket. At 5’10” she might have offered some answers to Cassi and Tori. Tori had at least five blocks (by my count) on Stephanie Young (14 points). She should shine at Stonehill next season. The Spartans shot a sizzling 26-for-44 (59%). A great inside game will do that for you. If Lee is searching for a stat that did them in here’s one: they were 0-for-14 on 3-pointers. Hit a couple of those and things would have been even more interesting in their late-game rush. 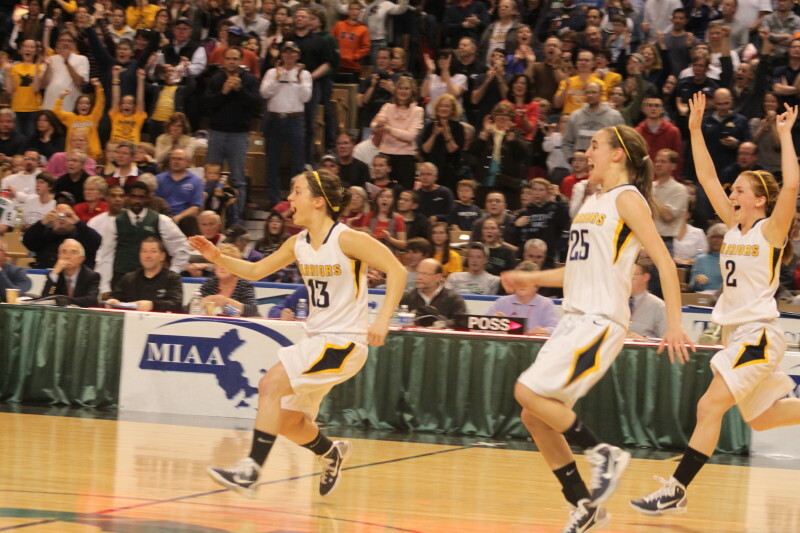 Andover girls rush to celebrate second straight title. 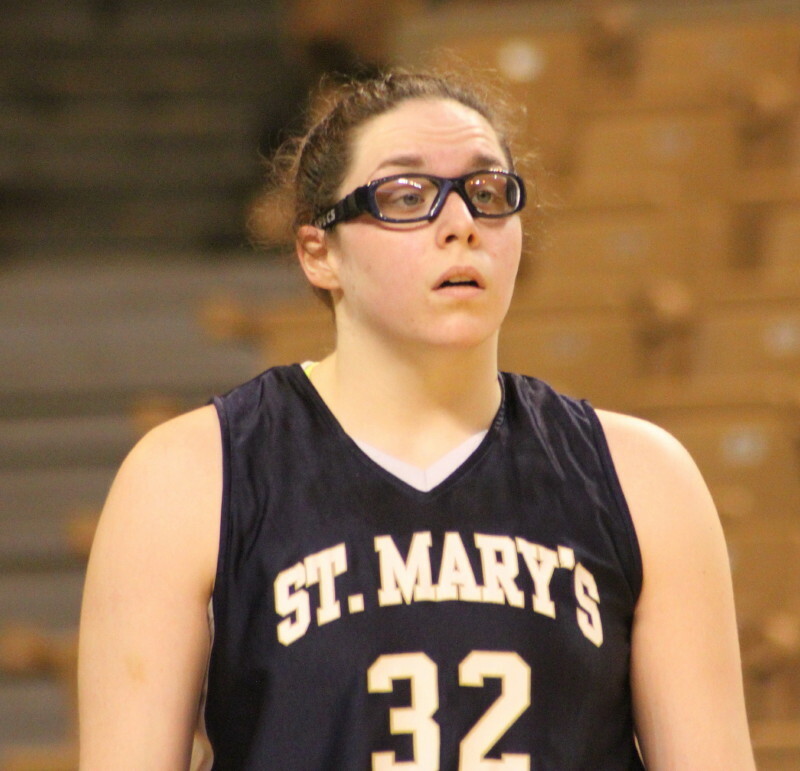 Nicole Boudreau removes her game-face during the closing seconds. Senior Natalie Gomez-Martinez ends her career with a state title.